Please come in and visit with the members of the Champlin, D'Antonio and Paynich families! Like many people, we live in a "blended" family. 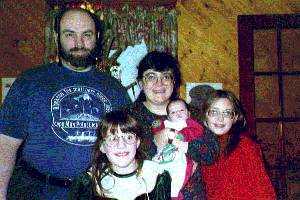 I married Al Paynich on May 23, 1983 (my birthday), we had 2 daughters, Margaret and Nicole in 1985 and 1987, and divorced in 1992. 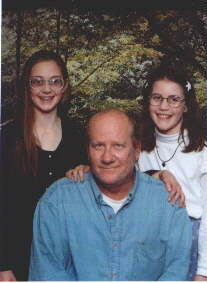 That year I married John Roy Champlin, and we had a daughter, Bridget in 1996. John died on March 15, 2002. 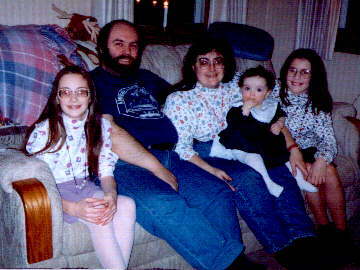 Click "John Roy Champlin Memorial Page" for his memorial page. We are still "blended" in that Al lives with Nicole, Bridget and me. 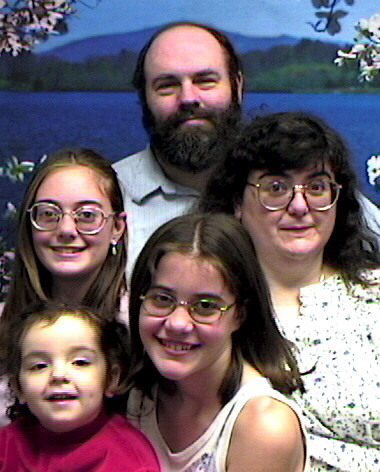 Margaret went away to college in August 2003 and probably won't live at home full time anymore. 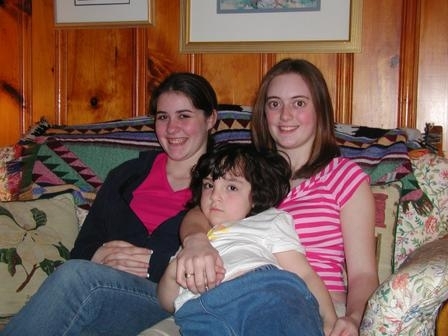 A really old picture of (L-R) Margaret, Al & Nicole from 1997. 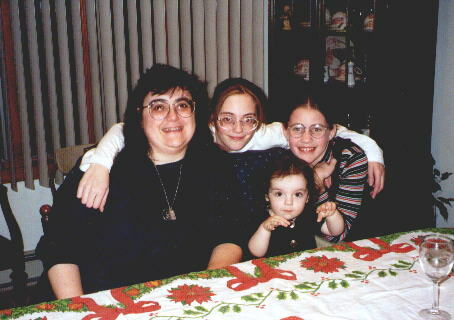 At Grandma's house, Christmas Eve 1998. You might be wondering who the "Twigsy" in "Twigsy's Twilight Cafe" is -- it's me! I've had the nickname since I was a little girl and my dad's friends used to call me "Little Twigsy" after my dad, whose nickname was "Twigs." I even have it on my license plates (and have old plates from Arizona and Texas with the name on them). Just one of the ways I stand out in the world. For more about Nicole, click on her name. For more about Bridget as a baby, click on her name. For more about Bridget as a toddler, click here. More Bridget pages! Bridget and food, Bridget at play, Bridget being cute, and Bridget's Blue's Clues page! This way to the December Moms' Recipe Box. Photos from Momcon '98: The Birthday Bash, Saturday afternoon, Sunday morning, and Sunday afternoon. View our 1998 HTML Holiday Card. ACKNOWLEDGEMENTS I wish to thank the members of my December Moms list for all their help and for having great web pages from which I could get some art! Special thanks to Linda, Casey, Cindy and Kathy who had pages that gave me inspiration and ideas.